It’s important that you become familiar with the following elements of the user interface, this will help you to start using Harmony Paint. 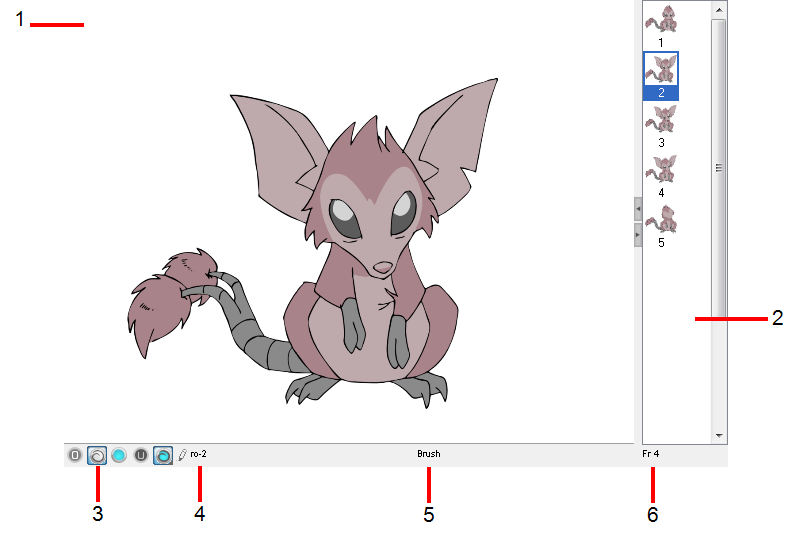 You can learn more about the highlights described here, and how to use them in a production context, throughout this guide. This is Harmony Paint’s default workspace, it is restored every time you launch a session. The top menu contains most of the commands. This menu is always located at the very top of the user interface. Each view has a Quick Access Menu containing recurring actions. This menu is accessed by right-clicking anywhere in the view. The Drawing View toolbar contains the main options and features you will use while working in Harmony Paint. You can customize this toolbar to display the features you use the most. Refer to the Managing the Toolbars to learn how. The Tools toolbar contains all of the main tools you will use while working in Harmony Paint. This is the Drawing view’s main space, it is where you draw, and where the drawings are displayed. The Drawing Thumbnails view display a list with thumbnails of the loaded drawings. The highlighted drawing is the one displayed in the drawing area. You can select the drawing you want to paint directly from this list. Click on this button to switch to the drawing’s Overlay layer. This layer is located above the Line Art layer. The shortcut is [:]. 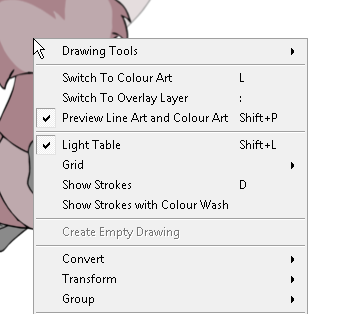 Click on this button to switch to the Line Art layer of the drawing. The shortcut is [L]. Click on this button to switch to the Colour Art layer of the drawing. The shortcut is [L]. Click on this button to switch to the drawing’s Underlay layer. This layer is located under the Colour Art layer. The shorcut is [:]. Click on this button to switch to Preview mode. This lets you see both Line Art and Colour Art layers simultaneously. The shortcut is [Shift] + [P]. Hold the Preview mode button to display a drop-down list in which you can enable the Underlay or Overlay layers to include them in the preview. The Drawing Name field displays the name of the selected drawing as well as the layer containing it. 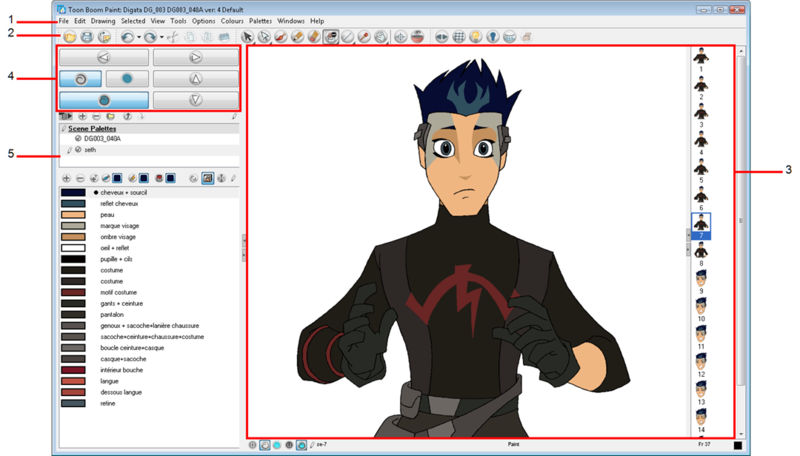 If the cell does not contain any drawings, an Empty Cell text is shown in the field. The Tool Name field displays the name of the selected tool. If you override a tool using an overriding keyboard shortcut, the tool’s name will be highlighted in red letters. Refer to the Override Tool to learn how to temporarily override a tool. These buttons let you switch to the previous or next drawings. The shortcuts are [F] and [G]. These buttons are used to switch to the previous or next layer when you have different layers loaded. The shortcuts are [H] and [J]. Use these buttons to switch from Line Art to Colour Art. The shortcut is [L]. You can also enable or disable the Preview mode. The shortcuts are [Shift] + [P].